America is having a lot of tough conversations about gun culture today, as students across the country are walking out of school to protest firearms violence. But other countries have their own problems with guns, as a news story about an inebriated Chinese man in northeast Yunnan’s Zhaotong Prefecture tells. 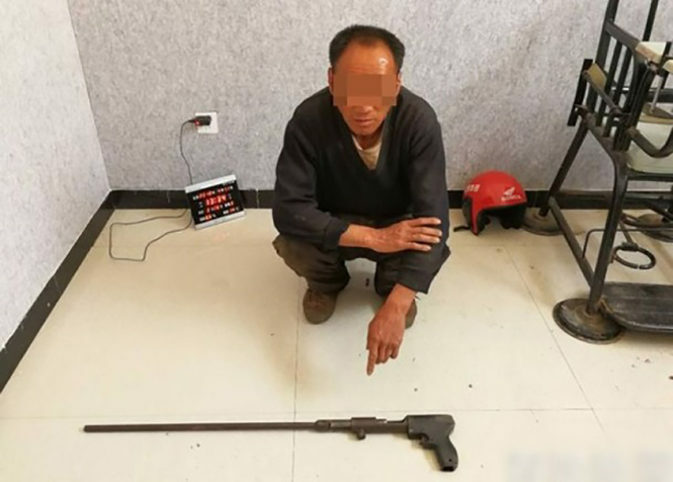 The article tells the tale of a trio of laborers who decided to let off some steam by downing a bunch of the potent alcohol known as baijiu and then shooting each other with a bizarre homemade gun, pictured above. Civilian ownership of firearms is tightly controlled by the Chinese government, even air rifles, so having a weapon of this sort at all is quite unusual. It actually belonged to the neighbor of one of the men, a man named Li. The trio began to argue about who was the best shot, and borrowed the device to prove themselves. The three first tried to assess their prowess by shooting a glass off the top of a doorframe. When none of the drunks could do it, one of the men – a different guy named Li – bet his two friends that they couldn’t shoot him in the groin. That’s a bet you shouldn’t make, people. The third man, a Mr. Nie, took aim and racked his pal right in the ballsack with one shot. Thankfully, the weapon – a modified nailgun – was loaded with dried beans and not bullets or nails. That’s cold comfort to Li, though, because the bean pierced right through his testicle. He was taken to the hospital and Mr. Nie was jailed for assault.